Have you thought about upgrading your business cards to something guaranteed to grab anyone's attention? Plastic business card printing provides both an attractive and practical solution to this idea. The material is sturdy enough to withstand tears and to resist to damage from water. Our three plastic types—clear, frosted, and white—offer unique and luxurious looking surfaces that will stun anyone who comes across your business cards. Clear plastic business cards are printed on a transparent, see-through material that begs you to take a closer look. The clear finish also adds emphasis to your company name, logo, and contact details. Note: All plastic clear cards come with a protective film to prevent the material from getting scratched during shipping. Upon receiving your order, remove the film to reveal the plastic's see-through appearance. 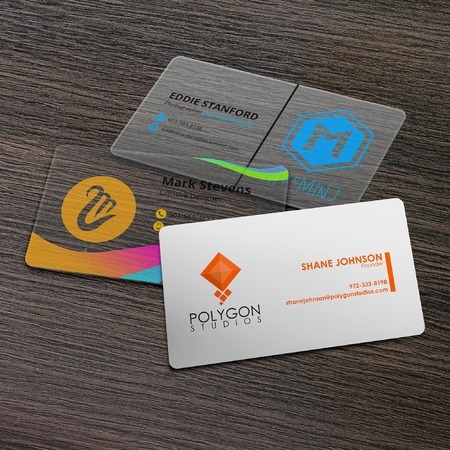 Frosted plastic business cards use a semi-transparent material that still appears clean and futuristic. The plastic's frosted finish provides a more distinct but also glass-like background to your design. White plastic business cards come in an opaque material that suits designs dependent on bright and bold hues. The background is a perfect contrast to daring shades such as red and orange or dark hues such as black or navy. 1) When you create business cards for plastic, make sure to use a font size above 8 pt., and strokes or lines at, or above, 1.5 pt., so all elements are easy to read. 2) Avoid including white areas and text on the design. White colored areas in your design will blend in with the material's clear, frosted, or white plastic background. Larger sizes on rectangle or square designs can apply bigger and colorful images. Utilize the space to bring attention to your logo or the kind of product or service your business offers in a central image. This size can be used to create simple plastic gift cards or loyalty cards. Frosted and clear plastic business cards are also great alternatives to custom die-cut business cards since their transparent backgrounds give the illusion of a blank space. You can make the plastic appear like an object associated with your service, such as a viewfinder for photographers, a clean window for a cleaning service, or a white canvas for an illustrator or graphic designer. Smaller square and thin plastic business cards should stick to a minimalist design. This approach highlights your company name, information, and contact details. Use a color that contrasts the plastic's background. A bold, black font is a safe choice for all three plastic materials but you could also use more distinct shades such as navy or red. Stay away from light, pastel or neon colors that would fade into the plastic background. You can also check out our guide on the anatomy of business cards and impactful ways that use psychology to increase the appeal of business cards. 2" x 3.5" rectangle is the standard size that fits in small wallets and business card holders. 2.125" x 3.375" rectangle has the same dimensions as a credit card. This is recommended for companies that want to target high-end, discerning clientele. Brands with luxury branding can also create discount cards for their premium product and services, such as a promo for a spa or a fine dining restaurant. 2.5" x 2.5" square works best for designs laid out in smaller, narrower dimensions. We also offer an oval shape that will distinguish your brand from the standard business card printing practice. Our plastic business card printing services are cheap and great for any company, whether you're a creative agency or a small business owner. Upload your ready made file or use our online tool to get started on that dynamic design today. Can I add magnetic strips, sequential numbering or variable printing to my plastic business cards? Our plastic is best utilized in a business card format so your information stands out against traditional materials such as paper and card stock. We cannot add magnetic strips, sequential numbering or apply variable printing to your orders. How thick is your 20 pt. plastic material? Our 20 pt. material is slightly thinner than a credit card but just as durable thanks to its tearproof and waterproof qualities. It is guaranteed to last years and won't get destroyed as long as your customers keep the plastic business card. How will the white areas of my design appear on a clear, frosted, and white plastic card? All white areas in your design will blend with the plastic's appearance. This means white ink will appear transparent on a clear card, frosted on a semi-transparent one, and white on the opaque white material. How can I design a plastic business card? It's important to keep several design principles in mind. Make sure the information and images don't appear cluttered. Use colors and fonts that are easy to read. We recommend having a professional design your card or you could use our online design tool to guide you. You can request for a free file check to be sure it is free from printing errors before proceeding to print.